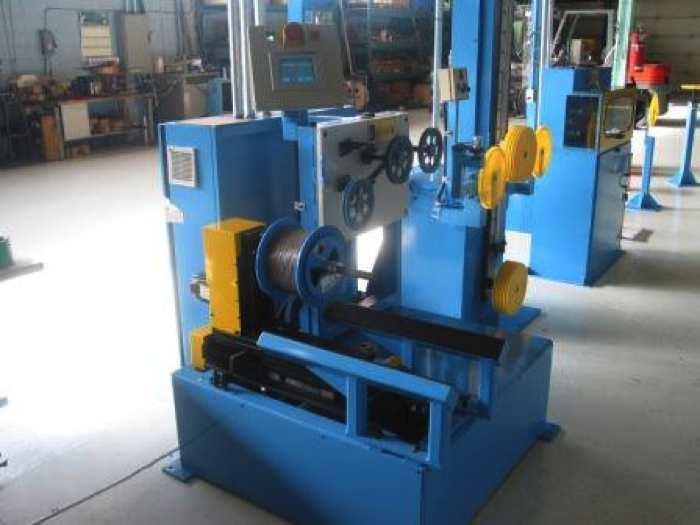 Take-Ups - Cable | Tensor Machinery Ltd. There are a variety of cable take-ups available, from smaller 800 mm reels to larger 2400 mm reels. Most of these take-ups are driven with an AC Vector motor with either traversing reels or a traversing guide arm. Tensor mainly designs these for larger reels up to 2400mm, as shown here. Two arms extend down from a beam structure, which can open, close, raise and lower to lift the reel into the run location. The design shown here has a driven tire that runs on the edge of the reel flange. We also supply Take-ups that have a driven pintle arm. Local controls are located on a swing arm, allowing the operator to set the parameters and control the take-up from a variety of positions. A small control box is also included on the back side of the take-up to help with loading the reels. We offer this for reels up to 1250 mm diameter. This take-up has two arms that extend down and can raise/lower as well as travel in/out to accommodate a variety of reel sizes. A drive pintle arm with an adjustable drive pin ensures that the reels are positively driven. The pintles are interchangeable for different reel types. A traversing pulley system is also mounted above the take-up. The traverse system is designed to guide the cable product smoothly and without any sharp bending, which may damage the cable. The final guide pulley has an adjustable mount to allow the pulley to be adjusted as close as possible to the reel and provide a smooth wind. A touchscreen control panel mounted on a swing arm allows the operator to control the take-up and input parameters. The take-up can be made stand alone with its own PLC or it can be integrated into the line. This type of take-up is typically used in the Premise jacketing lines in conjunction with a 300 meter accumulator. In some cases, two of these take-ups are placed side by side to facilitate faster changeovers while the line is running. 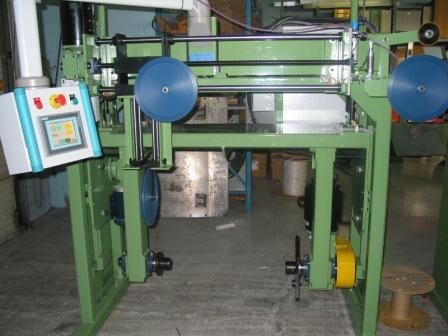 This take-up is used for reels up to 1000 mm. This design has two pivoting cantilever arms that extend from the frame and raise/lower with an air-cylinder. The reel is rolled between the two arms where one pintle closes on the reel. The reel is then lifted off the floor. 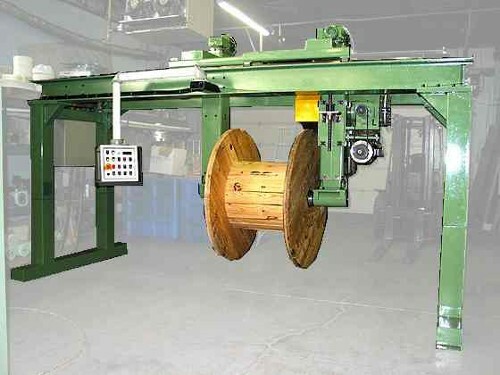 The arms can raise a variety of reel sizes from the floor to avoid heavy lifting by the operator. The reel drive is attached to one pivot arm and is driven by an AC Vector motor. The second pivot arm contains an adjustable pintle and uses an air-cylinder to engage the reel. 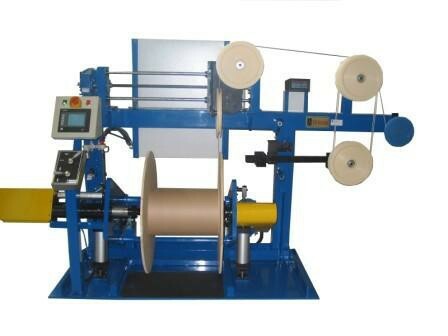 This allows various reel widths to be used. For smaller reel widths, a pintle extension is used. The reel is squeezed between polyurethane discs by the air-cylinder. An adjustable drive dog pin is also provided. Cable tension is provided using a two-loop Dancer/Accumulator arm integrated into the take-up. This dancer provides tension with the use of an adjustable weight. A traversing pulley system is also mounted above the take-up. The traverse system is designed to guide the cable product smoothly and without any sharp bending, which may damage the cable. The final guide pulley has an adjustable mount to allow the pulley to be adjusted as close as possible to the reel, providing a smooth wind. A PLC and operator touchpanel allow the operator to set and store the take-up parameters. These take-ups are mainly designed for smaller reel sizes and fibers or sires that require low tension. The STU Take-up is a traversing shaft design where the entire reel assembly traverses. A single shaft extends from the frame and is driven by a servo motor. A low tension dancer controls the speed and provides consistent tension on the product. In addition we have a Dual Shaft Take-up with a Dancer/Accumulator. The cantilever take-up assemblies are mounted on individual traversing bases driven by a servo motor. 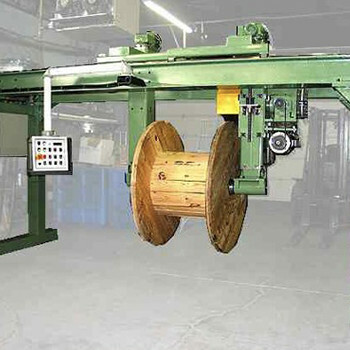 With the accumulator, the operator can easily transfer the cable product to a new reel while the line continues to run. 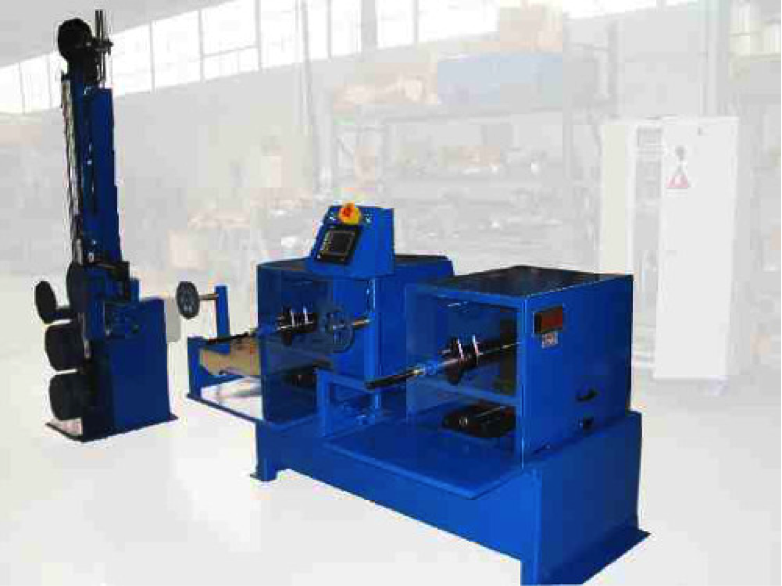 The accumulator provide the speed and tension control. A local PLC and HMI are mounted with the take-up and can interface with the main line. There are a variety of take-up designs that we build. Contact us for more information.